The World Federation of the Deaf is pleased to announce that the 3rd International Conference of the World Federation of the Deaf (WFD) will be held in Budapest, Hungary from 9th to 11th November 2017. The Theme of the Conference will be "Full inclusion with sign language!" Underlying the theme is the belief that full social inclusion of Deaf people is possible if sign language is recognised and used widely within society. Come down to the Whangarei Aquatic Centre for our Glow Party Wave Rave. In the past our glow parties have proven to be the biggest of all our themed wave raves. We have games, competitions, prizes, the latest music, aqua run and so much more. Parents if you need somewhere to drop the kids off for a few hours come on down or you can come with them and supervise. Suitable for ages 8–16. What is VRI? VRI is a service that provides Deaf people access to a NZSL interpreter for communication with government agency staff when a face-to-face interpreter is not available. How does VRI work? VRI uses video to connect an interpreter in a remote location to a different location where Deaf person(s) and hearing person(s) are meeting face to face. For more information about how VRI works, how to access the VRI service and locations where the service is available go to: www.vri.govt.nz. Where is Video Remote Interpreting (VRI) available in Whangarei? 1. Tell the government agency at least two working days before your appointment that you require VRI and they will book the interpreter with the VRI service. 2. Arrive 15 minutes before your appointment to allow enough time to ensure the meeting room is arranged to suit your communication needs. 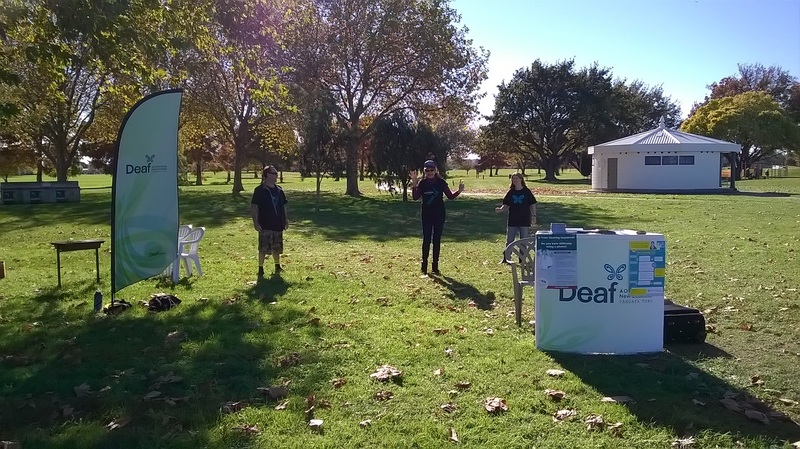 were members of the Deaf community – including DCM, interpreters, hearing professionals, people who have grown up with Deaf family members as well as a NZSL taster class for the audience. We had about 30 DCM and members of the public also – about 70 people. News article attached on the right. The visit to the library was also successful and while we had smaller numbers it was very informative and Deaf learned of all the services available through the library – including access to internet, ebooks, local area information and history, DVD’s etc. The visit to the Kiwi House and Museum was also very interesting with a follow up taster class which was a huge success. Many DCM didn’t realise what flora and fauna we have right on the doorstep and we were lucky enough to be able to see a live tuatara out of the enclosure. 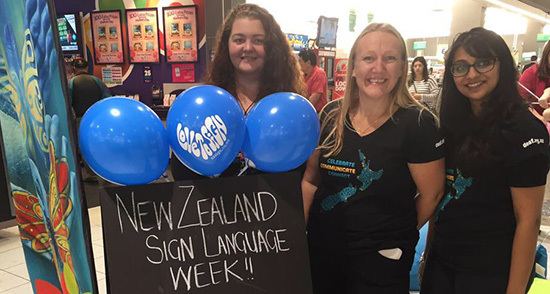 New Zealand Sign Language Week last week in Auckland was successful! The week started off with a NZSL Open Day at Manukau Mall where we taught NZSL to the community. We delivered short taster classes, told stories, and even had a balloon twister come to join in the fun! Next, we had the interpreted Comedy Festival shows which we particularly enjoyed. The interpreters do so well to interpret the comedians, and was even accused of upstaging them! 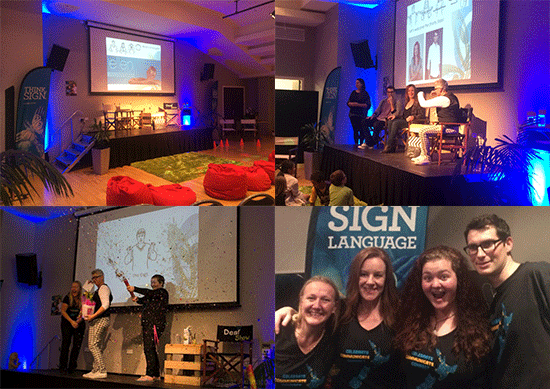 Comedy Festival was a great part of NZSL week as it brought awareness to the hearing community who were inspired and desired to know NZSL after the show. 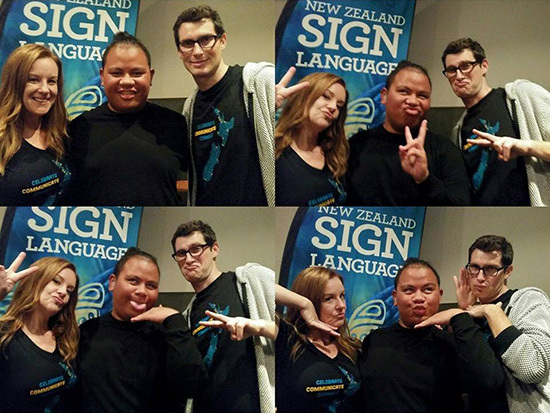 The Ellen Talk Show came next on Friday night at Auckland Deaf Society, and it was such a great night overall. Many of you had wondered who the deaf version of Ellen had been, and were not surprised when she was revealed! We had two Shortland Street stars join us on the night, and one of them was even close to being fluent in NZSL. 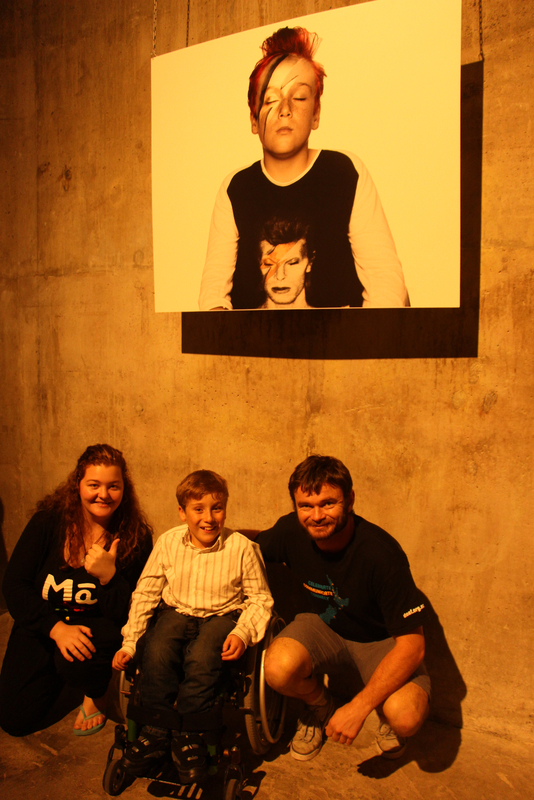 Many photos were taken on the night which are all on the Deaf Aotearoa Facebook page if you are interested to see. There was a competition as well for the best selfie with the stars. The winner won tickets for a tour in Shortland Street and possibly even an appearance on the show! The winner of this competition was Joesph Tusa. Congratulations!!! Lastly, we ended the week with a celebration at Karanga Plaza, which was a success in itself. Similar to the Manukau Mall Open Day, we taught NZSL, shared stories in NZSL, plus we also shared the work of Deaf artists as well as displaying our own collaborated piece of work. 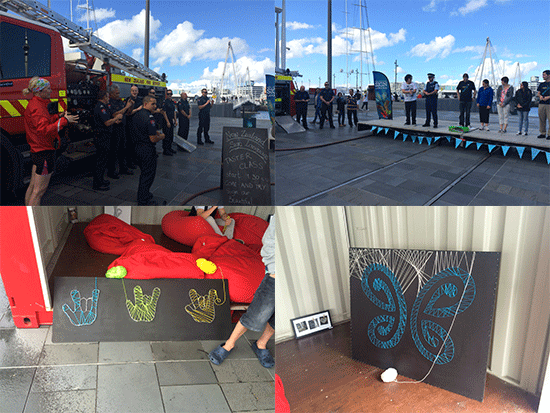 The fire service and police came down to join the show, and even got involved with learning NZSL. Free sausages were given away when told a sign they had learnt for the day, and card making for Mother’s Day were available for young kids. On behalf of Deaf Aotearoa in Auckland region, we thank those who got involved and make the events as successful as it was, those who gave their time and volunteered, and those who have supported us throughout the week. Natasha and Rachel hopes you all enjoyed the week, and are already looking forward to next year!!! The generous folk at the Rotary Club of Newmarket are funding tickets for a super show called Circus Quirkus. If you haven't been before you'll want to go. If you've been before you'll want to go back! It's a blend of different acts—comedy, clowns, juggling, magic tricks and gymnastic bendy stuff—all blended together with good old entertainment. It's a fabulous all ages event and we are lucky to have tickets to give out to members free of charge! Parking is also free for ticket holders. Kelston Deaf Education Centre are looking for two NZSL tutors to teach students, parents and whanau in mainstream schools. One full time tutor for Waikato and one part time tutor for Bay of Plenty. Please click on flyer for further information and who to contact to send off your cover letter and CV. Please have a look the attached for information and registration form. For more information please contact Judith Mason (judithm@cda.org.nz) or Sian Owen (siano@cda.org.nz). A theatre performance, performed by Deaf and hearing actors in both NZSL and English. 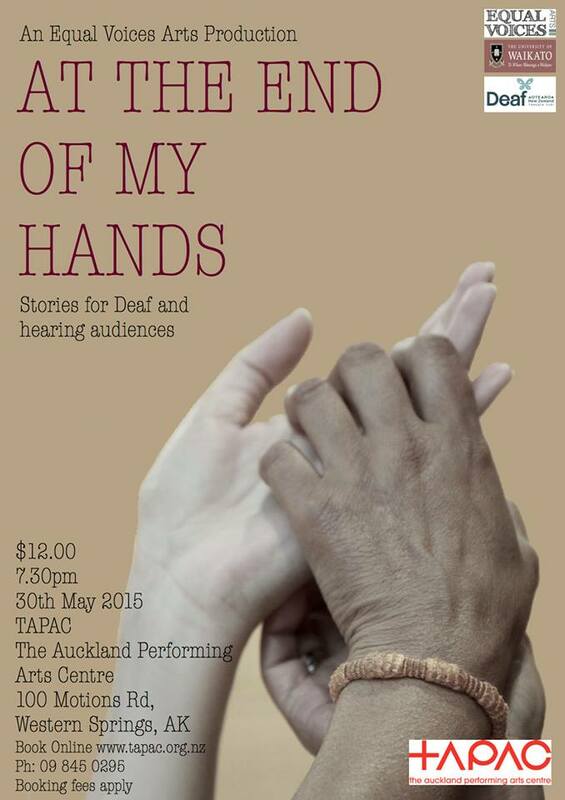 At The End Of My Hands shares stories of Deaf culture. 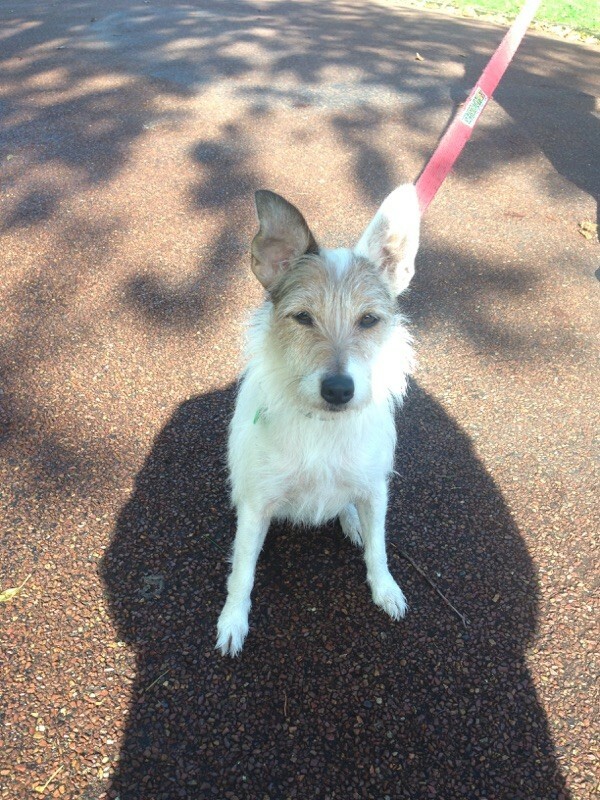 Do you want to adopt Deaf Dog? Need a good companion all the time. Easy going and good behaviour. Communicate through signing to Dog. Chelsea likes to eat raw products only. 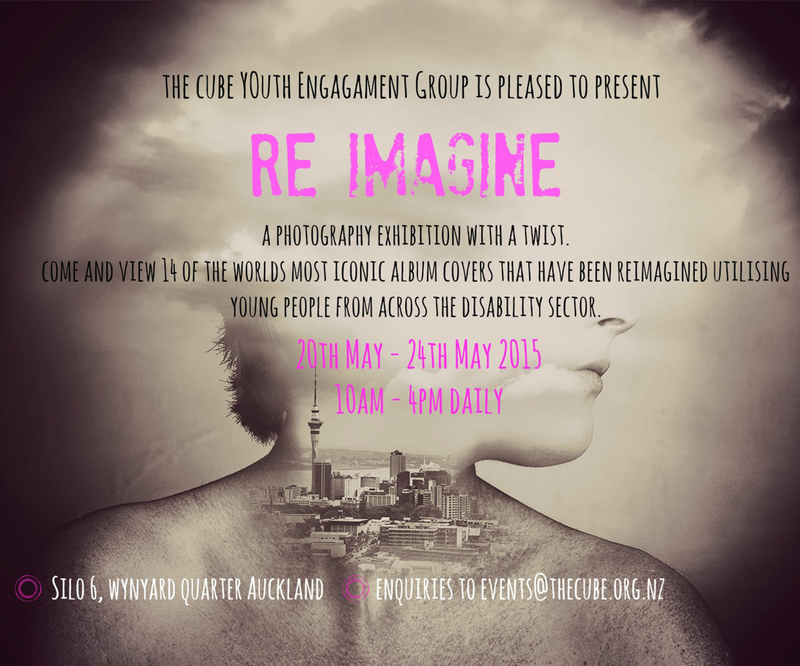 To mark the lead-up to Youth Week (23rd - 31st May), collective impact agency The Cube are reframing the youth and disability sectors, and challenging perceptions surrounding young people with disabilities. Demonstrating that the young people they work with have identities and cultures outside of their disabilities, The Cube are facilitating a series of youth-led and delivered events in the lead-up to Youth Week that celebrate young people’s achievements and abilities. Show your support by coming down to Silo 6 in Auckland’s Wynyard Qtr, between 10am and 4pm this weekend. Rachel, who was a youth worker intern for Magnet before being employed as a Community Relations Officer, and Phillip from our Magnet team have already been down to check it out and catch up with some of the models! 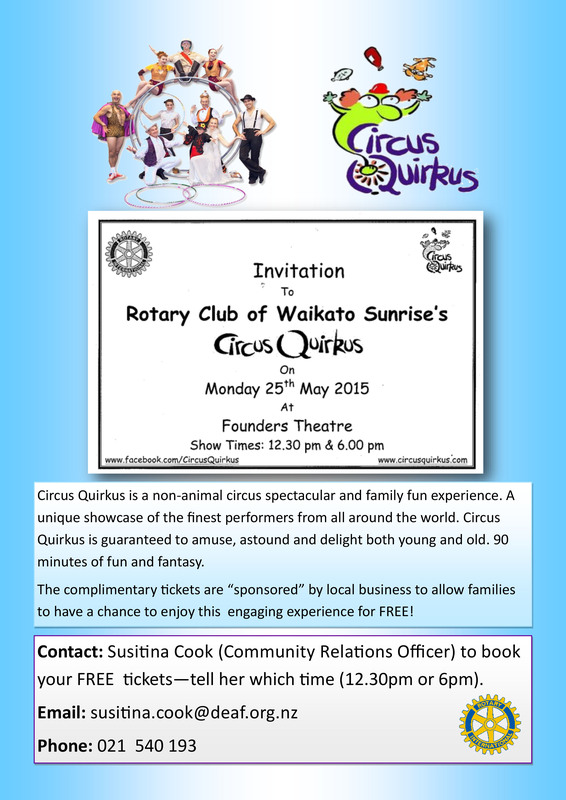 Rotary Club of Waikato Sunrise Circus Quirkus show - FREE Tickets! 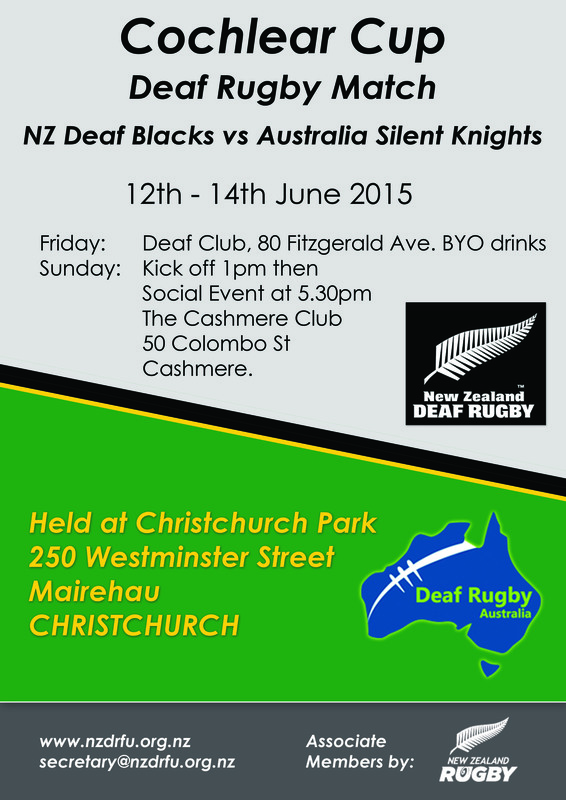 If you want tickets you need to contact Deaf Aotearoa, Hamilton office AS SOON AS POSSIBLE! A theatre performance brought to you by Equal Voices, performed by Deaf and hearing actors in both NZSL and English. At The End Of My Hands shares stories of Deaf culture. Are you Deaf, or Hard of Hearing? Ever thought about learning how to play an instrument? Ever dreamed of being in a band? Well - here is your chance!!! 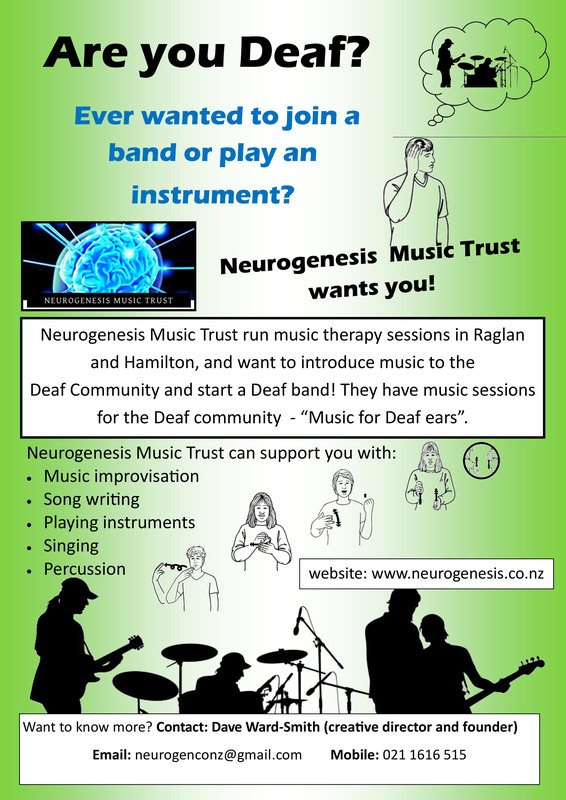 Dave from Neurogenesis Music Trust in Hamilton wants you to come along and help create a Deaf band. Dave can teach the drums and bass guitar. NZSL Week came and went by so quickly! 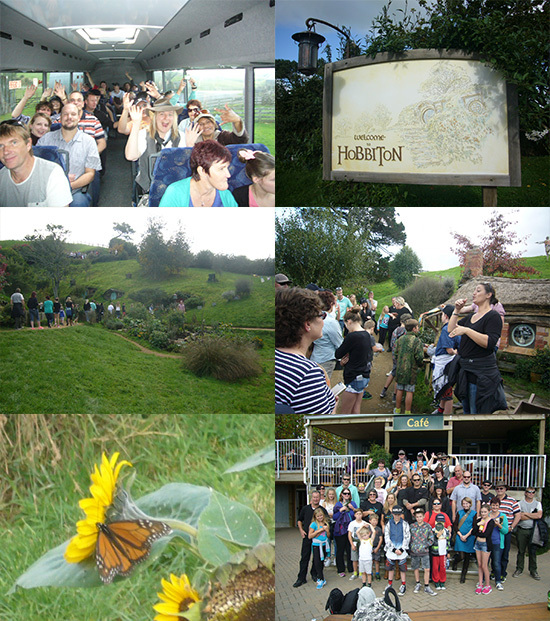 Bay of Plenty had three events: Rainbow Springs, an interpreted tour at the Tauranga Art Gallery and an interpreted Hobbit Tour. 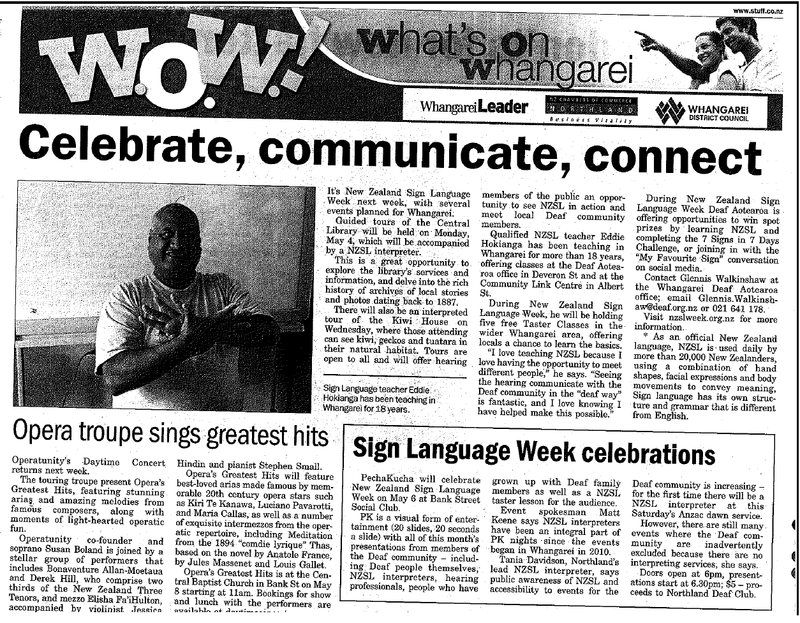 These events were enjoyed by the Deaf community, CODAs, people who had been to our Stir It Up events, students from NZSL classes and hearing people. 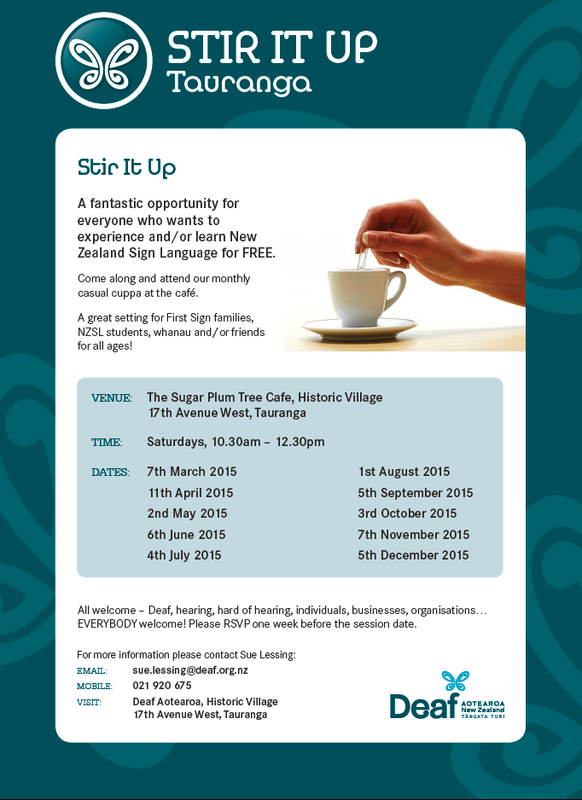 As well as these events, 50 taster classes were delivered in the Bay of Plenty by our NZSL taster class tutors. You will see a photo of the Sunflower with a butterfly – amazing how this happened being linked to the Deaf community! A tree on a hill above the Hobbit’s house door, is fake and it’s amazing how real it looks. Another huge tree is over 100 years old and is called the ‘Party Tree’ as people have parties around that area. 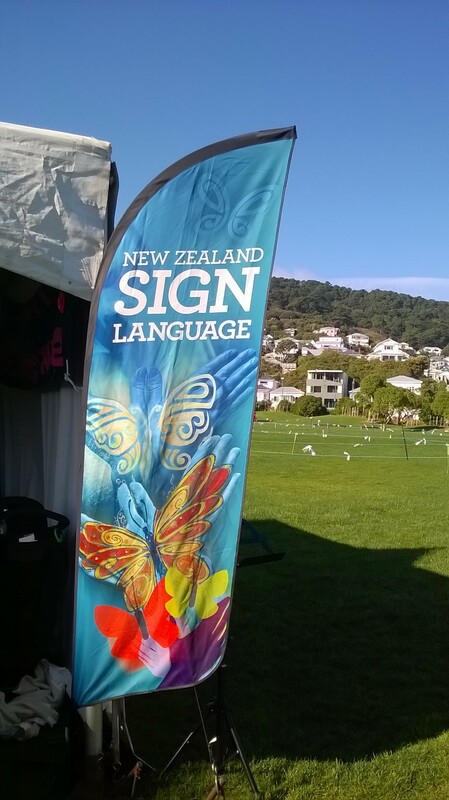 The Deaf community gained so much information by having NZSL interpreters. Thank you to all for being part of the events which was awesome! We are looking forward to the next NZSL Week! Did you enjoy NZSL Week? Do you have any comments you would like to pass on of what was happening in Bay of Plenty and around New Zealand? Is there anything you would like to share with us? Let Sue know if you have any ideas for next year. Contact Sue Lessing on sue.lessing@deaf.org.nz or text 021 920 675. Kelston Deaf Education Centre are looking for two NZSL tutors to teach students, parents and whanau in mainstream schools.One full time tutor for Waikato and one part time tutor for Bay of Plenty. Cost: Gold coin donation will be appreciated. 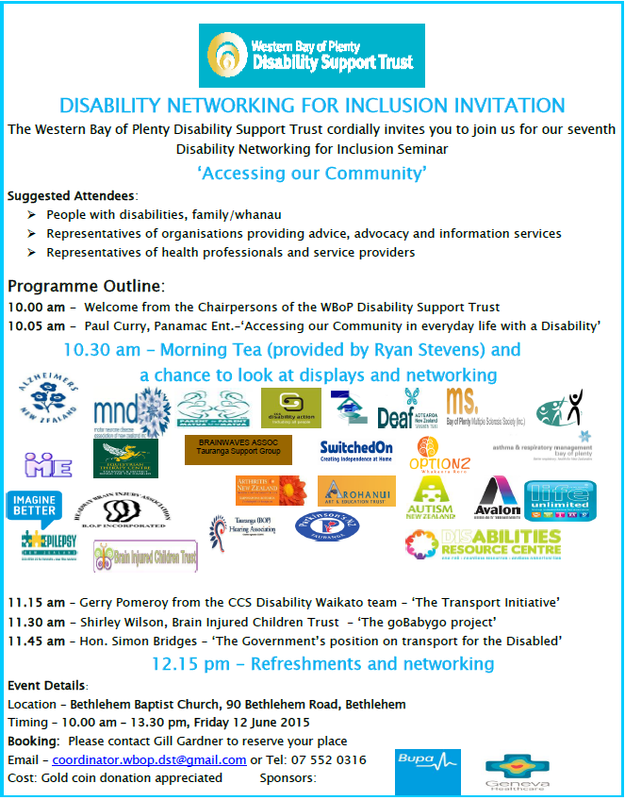 WBOPDST is hosting the seventh Disability Networking for Inclusion Seminar at the address and date given above. This is for people with disabilities, family/whanau, representatives of organisations, health professionals and service providers. Please contact Gill Gardner to book your seat and let her know you are a NZSL user. Click on flyer for Gill’s contacts and for more information. 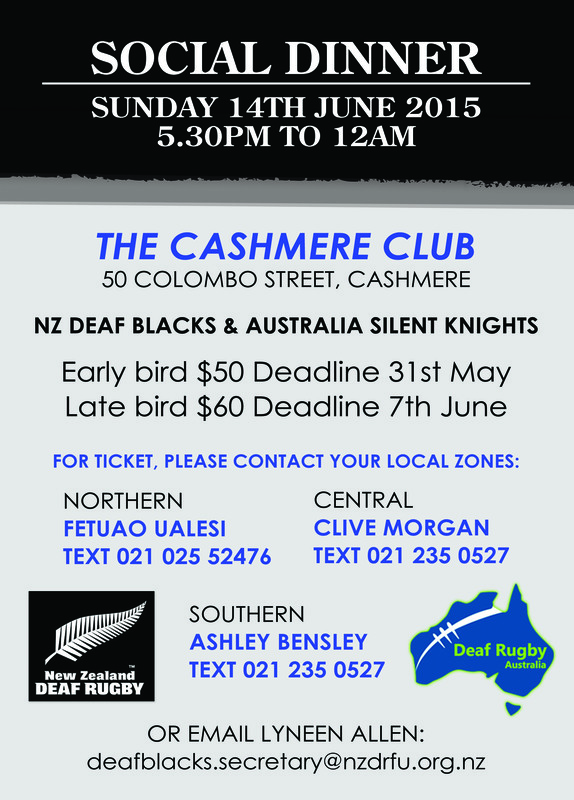 A fantastic opportunity for everyone who wants to experience and/or learn New Zealand Sign Language for free. Please let Sue Lessing know if you are coming as the Café needs to know how many people will attend for reserving tables and chairs by Tuesday 2nd June. Click on flyer for contact details and more information. 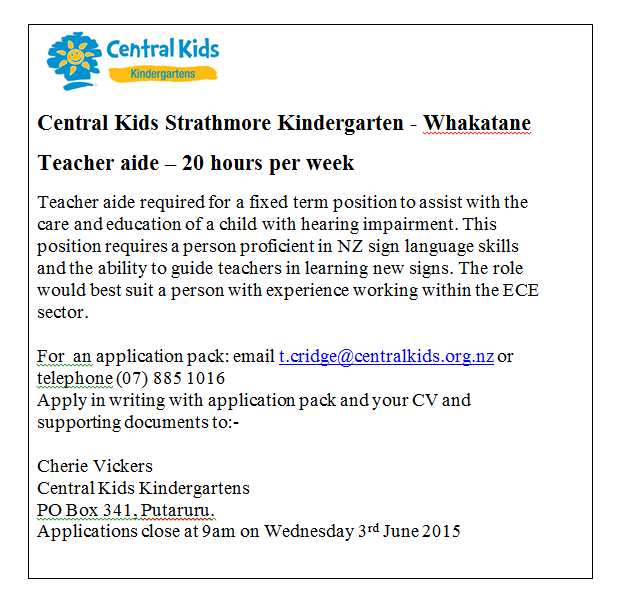 Central Kids Strathmore Kindergarten in Whakatane is looking for a Teacher aide for a Deaf pre-schooler for 20 hours per week. Click on the advert for more information. It's time to 'sharpen up your act' before the pruning season. Tool maintenance, techniques for hand tools, secateurs and hedge clippers. A must-do workshop for the home gardener! Do you need to have your signature witnessed, make a declaration, swear an affidavit or affirmation or have originals or copies certified? A Justice of the Peace will be on hand to help every Tuesday and Wednesday at Bell Block Library. This exhibition showcases the work of the 71 artists who are part of the Taranaki Arts Trail which is on 13-14 June 2015. The opening includes the Taonga Iti- Small Treasures Challenge whereby people responded to the call to create an art work using a matchbox. Packed with hundreds of products and services for the home, the Better Home & Living Show will inform and inspire anyone wanting to improve their lifestyle in a sustainable way. Featuring the latest eco-trends and innovations for indoors and out, massive show-only specials, free daily seminars, expert advice, plus the chance to win a fabulous show prize—it’s an event not to be missed. Better still, you’ll find it all under the one roof! Many thanks to all the tutors, volunteers, families and friends for supporting this year's NZSL Week. It was a wonderful week with beautiful weather. 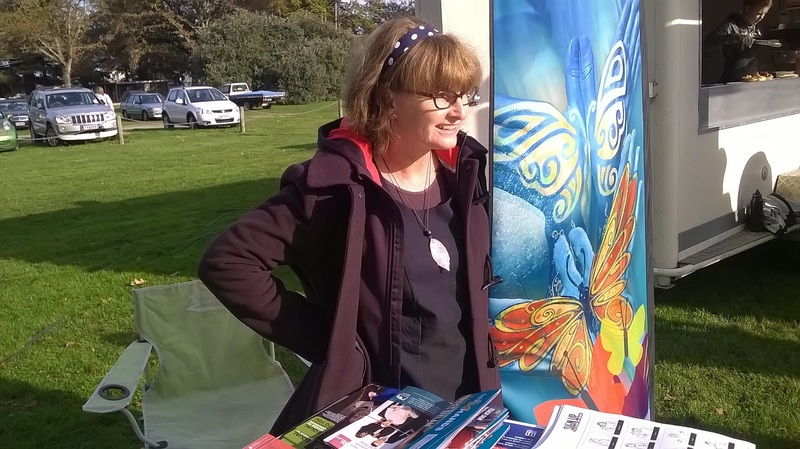 We started off at Farmers Market at Hastings on Sunday 3rd May and we finished off on Saturday 9th May at Anderson Park with “Day At The Park”. Again we were lucky to have good weather for this too. 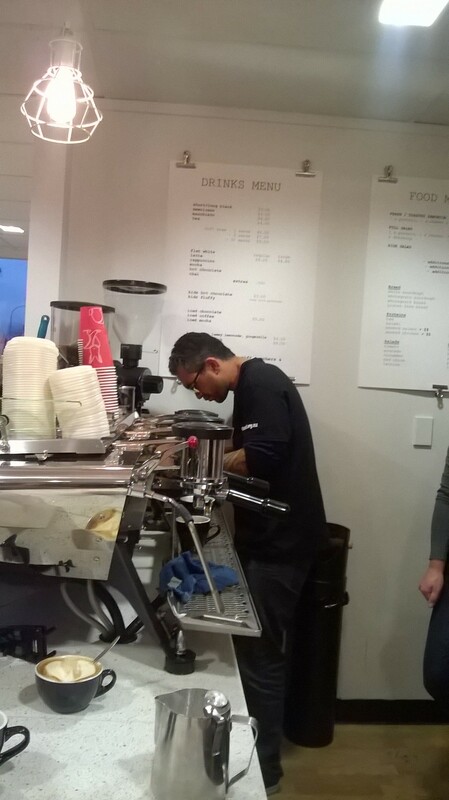 We also provided about 50 free NZSL tasters classes across Hawkes Bay and Gisborne. I hope we all can do this again next year – work together to make it look good. Remember next year it will be our 10th Anniversary so please do think about what you think we should do for May 2016. 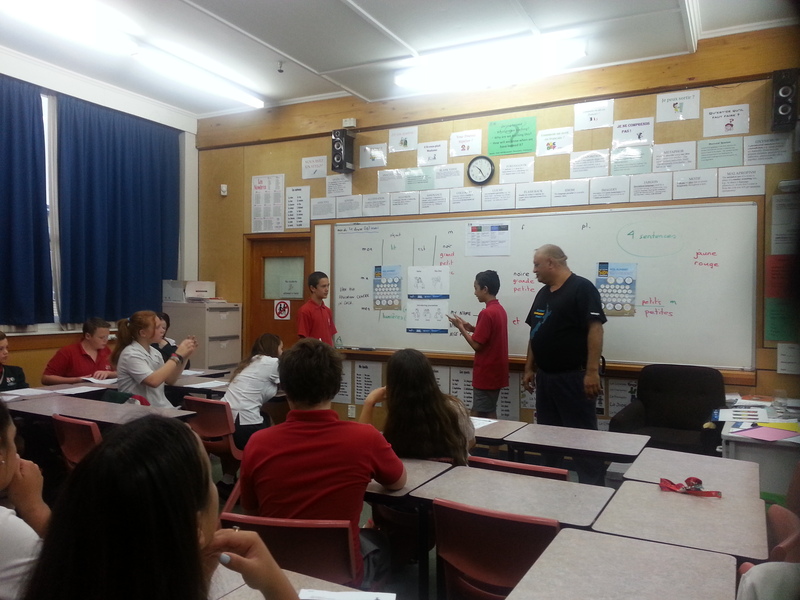 Here are some photos from our wonderful NZSL Week. Hastings District Libraries, Atomic, Tipene and Hastings City Art Gallery are excited to present Sounds in the Square! This free Youth Week event is a must for young musicians! Learn about the reality of working in the music industry. With thanks to Big Noise, Rezpect Dance Academy, Native Niche, Youth Week & NZ Music Month. What a fantastic week we had! 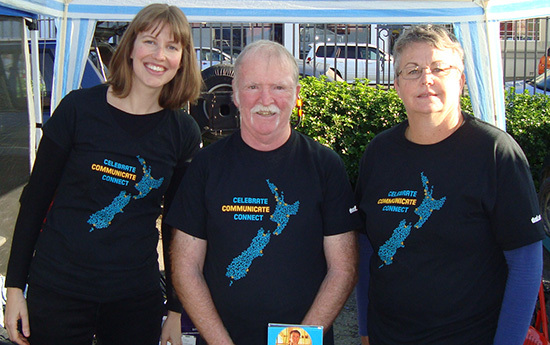 We had two tours, one in Wanganui and another in Palmerston North. In Wanganui a group of us went to the regional museum for a signed tour of the Māori Court. Then we had lunch at Columbus Café in Trafaglar Square before we headed to watch glassblowing and walk the tunnel at Durie Hill. This was a full day enjoyed by all! We were fortunate to have such a nice day where it was overcast but it wasn't hot, wasn't cold and wasn't windy! The tour in Palmerston North started off with a signed tour of the Rugby Museum. This was a very interesting tour. We learnt so much about where it began, how it began and the rugby tours back in the old days. We were so absorbed by what we learnt that we recommend the tour to anyone. After the tour we had a nice lunch at Rumours are Us where they provided great meals and drinks. We then headed to the Herb Farm in Ashhurst. Due to not enough people we were unable to have a signed guided tour however that didnt deter us, we still went for a nice walk around the gardens before having afternoon tea at the Herb Farm. Again it was a delicious afternoon tea before we all headed home! On the same evening, seven of us went to the captioned movie Insurgent and this again was enjoyed by all. We were fortunate to have this fall on NZSL Week after trying to encourage our local cinema to align this at the same time! 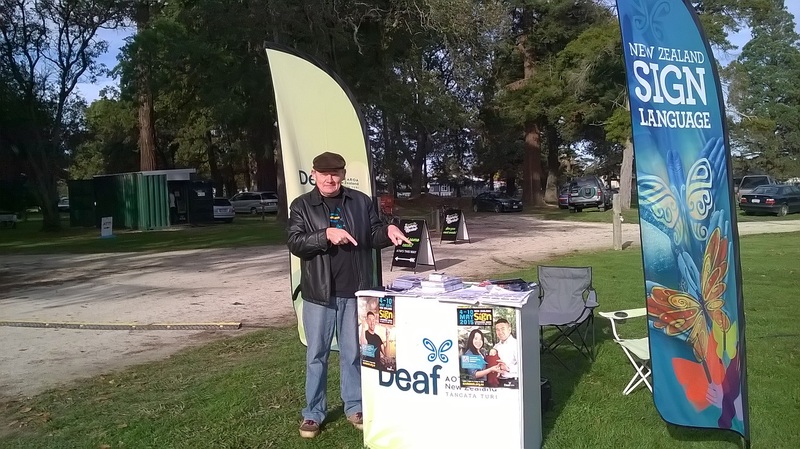 We had stalls at Wanganui Disability May Day, Deaf Aotearoa (unfortunately due to wet weather we had to have it in our offices) as well as at Bunnings. Hope you enjoy some of the photos. Many of you have enjoyed the signed tours over the last two years. I have thoroughly enjoyed organising them. We hope to do more next year, if you have an idea that you would like to share for NZSL Week next year, please let Lianna know! Weaving workshop starting in June! This workshop will be every Wednesday for five weeks. We need people interested that will attend all workshops. You can not just attend some—all workshops will follow on from the previous week. We need you to be committed to come to all five workshops. Please see flier for more information. If you are interested and want to attend, please contact Lianna to confirm your space. There are only 12 spaces available. Come and talk about grieving, understanding the grieving process, developing ongoing support and share resources. Lyneen will share her own grieving experience and Alexandra is a Deaf counsellor who will give advice and help understand the grieving process. Please contact Lyneen by email lyneen.la@gmail.com or text 022 323 4988 to confirm you are interested before 20th May. Let you all know in advance that Deaf Club will be closed on Friday 29nd May = No club night. This year Question Time and the Annual Budget will be NZSL Interpreted. 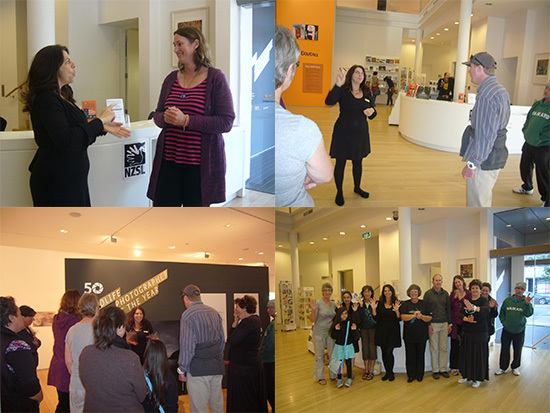 The public art tour is on Friday 22nd May at 10.30 a.m. and NZSL interpreters will be available. The 90 minute tour examines artworks by some of New Zealand’s most significant and renowned artists. You will view a variety of historical and contemporary art from the Parliamentary Collection and visit the featured exhibition in the Bowen House Exhibition Space. Do I need to book for these tours? Bookings are recommended. To book please email tour.desk@parliament.govt.nz or text 021 570 834. Tours start from the Visitor Centre in the Beehive (Executive Wing). NZSL interpreters will be on hand 15 minutes before the tours to assist with security procedures. Next up we had NZSL Interpreted tours of Parliament. 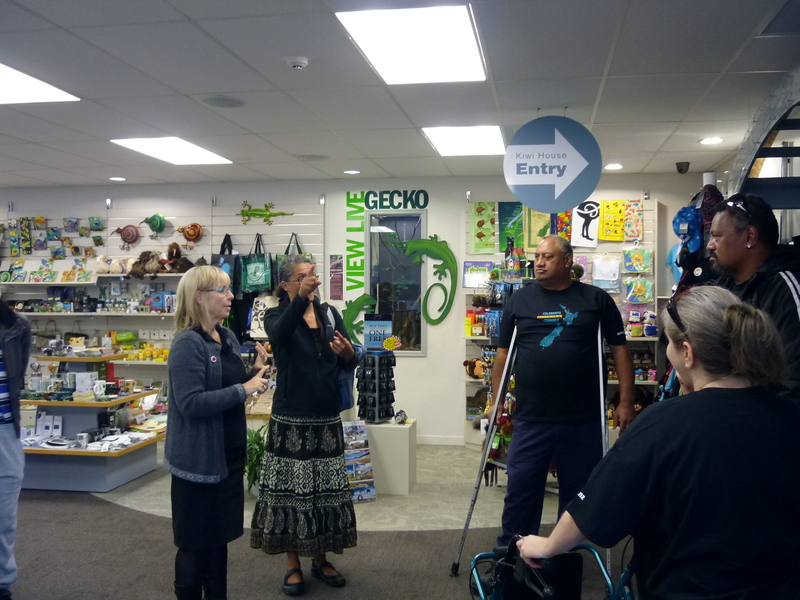 We had great feedback from these tours from both the Deaf Community that attended and others that thought it was great to see NZSL being used. 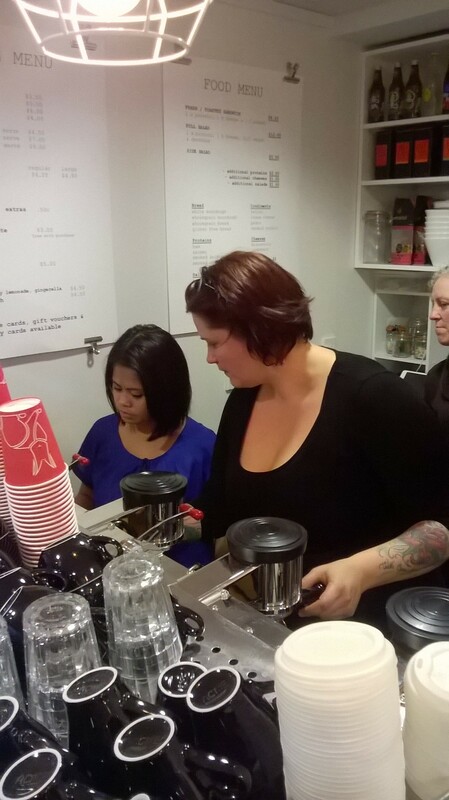 On Wednesday, Co-Ed Coffee Educators and Coffee Shop hosted a ‘Café Lingo’ afternoon. 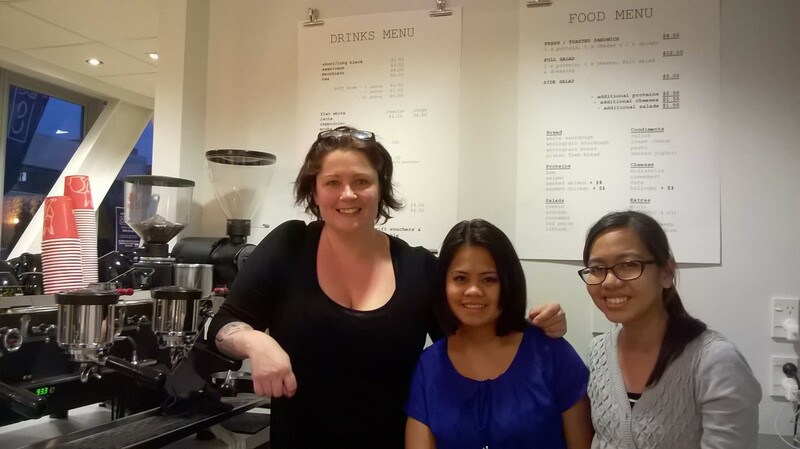 People dropped in to learn some NZSL Coffee Phrases and meet all the staff and Claire the owner, gave some Deaf Community members the chance to learn how to make the perfect coffee!! 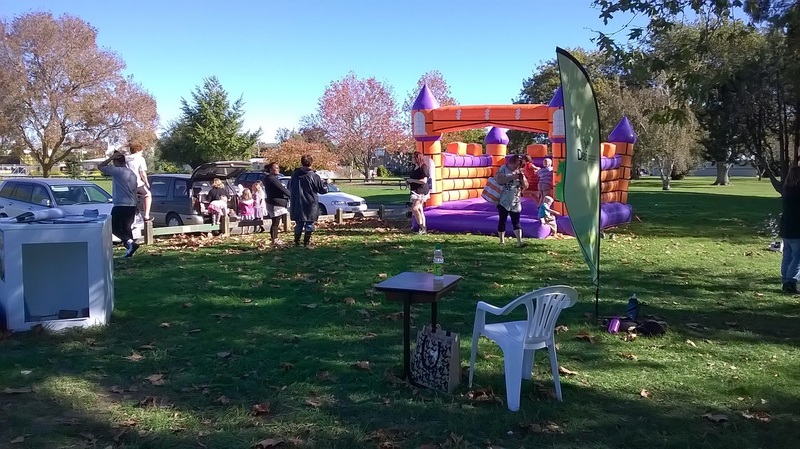 And finally we finished off the week with ‘NZSL in the Capital’, a picnic in the park and a chance for everyone to get together and celebrate NZSL. 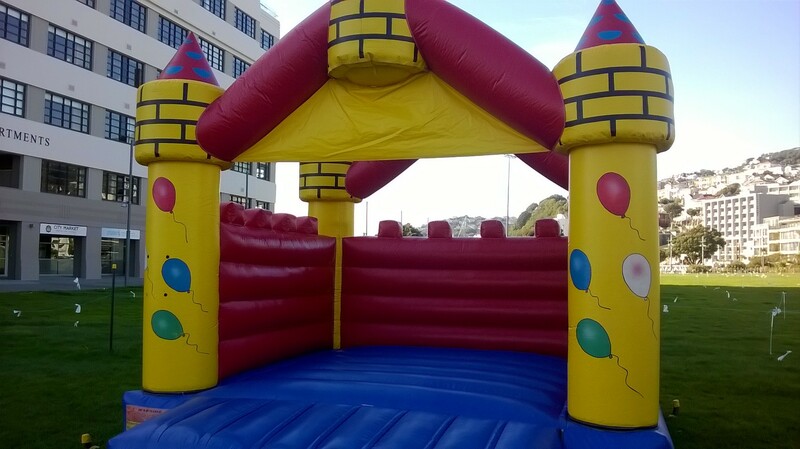 We had a bouncy castle which kept the little ones entertained. Wellington Deaf kept everybody fed with a sausage sizzle, Deaf and HoH Roller Derby Skaters Worldwide came along showing off skating technique, and then we were treated to a great performance of signed singing from the Kapiti Gospel Choir. It was a great day in the sunshine and the Wellington Wind played nicely with us and didn’t blow too strong. A big thank you to those that came along to celebrations here in Nelson. What an amazing time we all had at the pop up café, Richmond Mall, Roadhogs indoor golf and Circus Quirkus! Also thank you to the amazing tutors and volunteers, we couldn’t have done it without your support. We asked them to draw butterflies on the school playground in colourful chalk. We explained that the butterfly is Deaf, so this is the symbol for the Deaf. On Wednesday 6th May, Birchwood School also took part in the Butterflyathon. What a colourful display there was too. Mojo Mathers came to give a talk to the Nelson Deaf children and adults at Richmond Library on Monday 11th May. She shared her experience of growing up Deaf and her political journey. It was a very inspirational talk, good questions and answers were given at the end of the talk. Then a game of tenpin bowling was played after the talk as part of the Keep In Touch (KIT) day. We wished Michael Smith a very happy 50th Birthday. He celebrated at the Suburban club with lots of family and friends present. That was one impressive birthday cake! Katherine Hickson and I were involved in their storytimes with preschoolers and parents. We signed the We are going on a Bear Hunt story which they loved. Katherine provided a taster class. 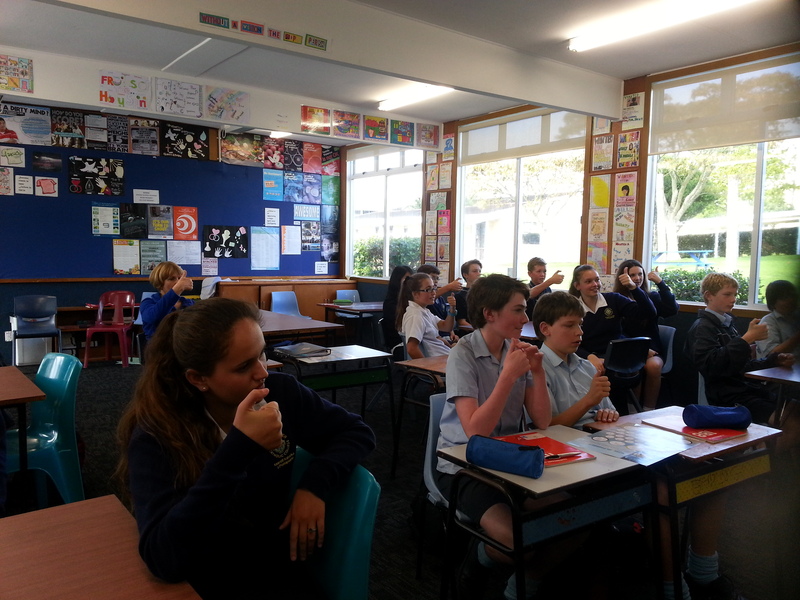 Your local Community Relations Officer, Victoria, went to Ashburton to mingle with NZSL students from the area who have been learning sign language. We had a friendly chat, polished their sign skills and they all enjoyed having me there. 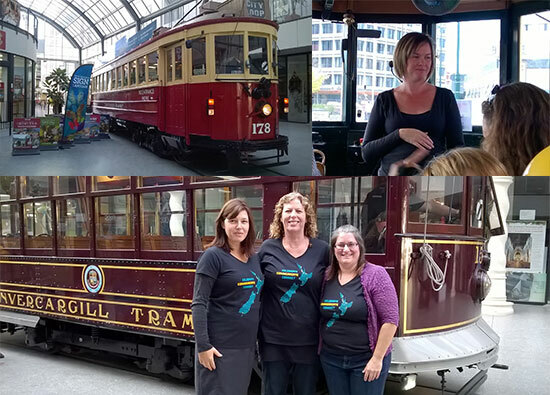 We organised for an interpreter to join two tram tours around our city. We learnt so much information about the history of the city, which we did not know before. There were positive feedback from community members. We are looking for a person who is fluent in NZSL for the position of support worker for a Deaf client. Hours will be between six to nine hours per week. The job will involve daily life routines such as trips to swimming pools, community classes, the library and other duties during the day. This position needs to be filled as soon as possible. If you are interested in the position, please contact Victoria Green for more details. 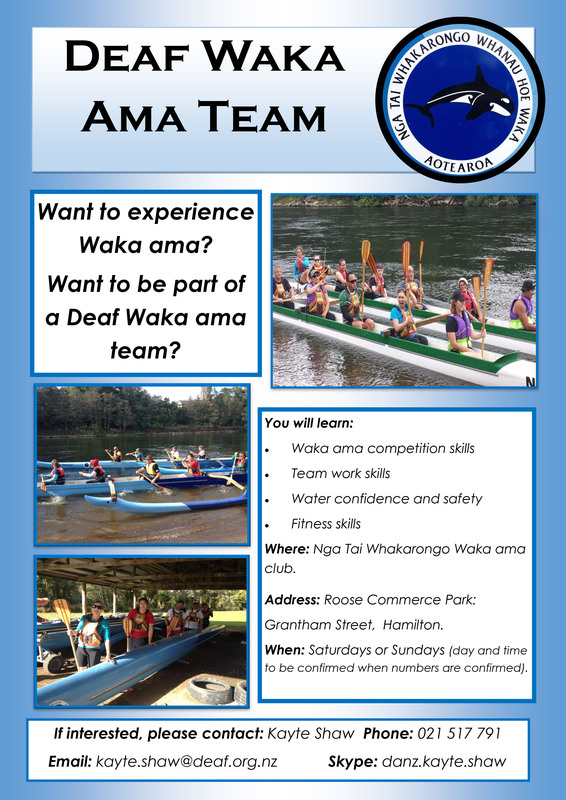 Email victoria.green@deaf.org.nz or text 021 324 828. They are having an Annual General Meeting at the new Clubroom. A refreshments will be provided and lunch can be available to buy. There is an opportunity for you to join us to learn new projects or share your project with the craft group, it can be knitting, crocheting, painting, etc. Please bring a plate to share for lunch, thank you. 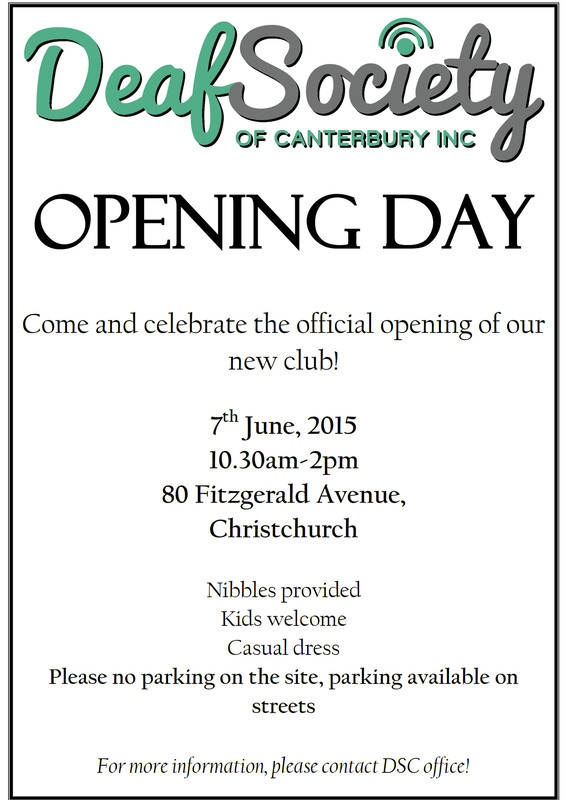 Deaf Society of Canterbury - New Club Room Opening Day! 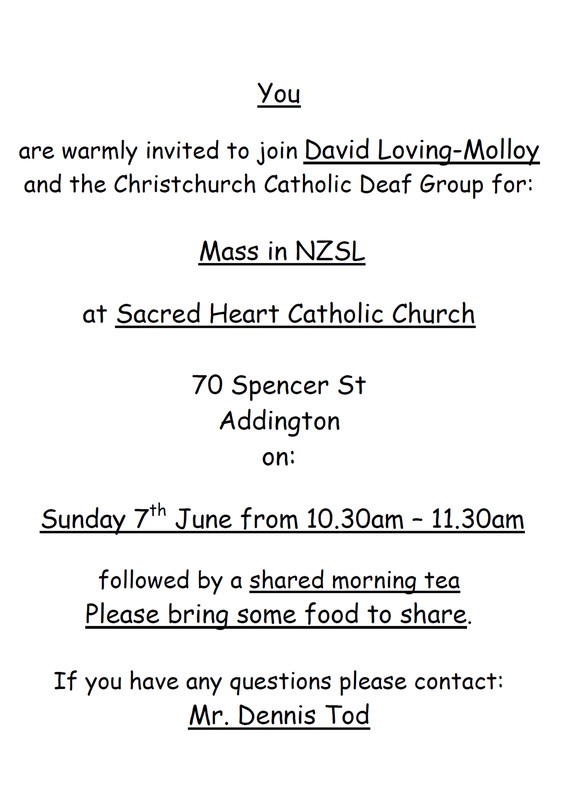 You are warmly invited to join David Loving-Molloy and the Christchurch Catholic Deaf Group for a mass in NZSL at Sacred Heart Catholic Church. There will be a shared morning tea afterwards the mass, please bring a plate to share. If you have any questions please contact Dennis Tod. Thank you for supporting NZSL Week! 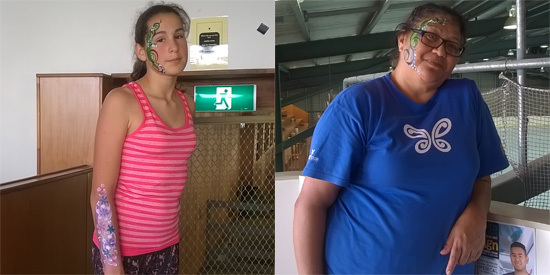 Thank you to everyone who volunteered to help make NZSL Week 2015 a success! We had many people helping with awareness table, storytelling and more. 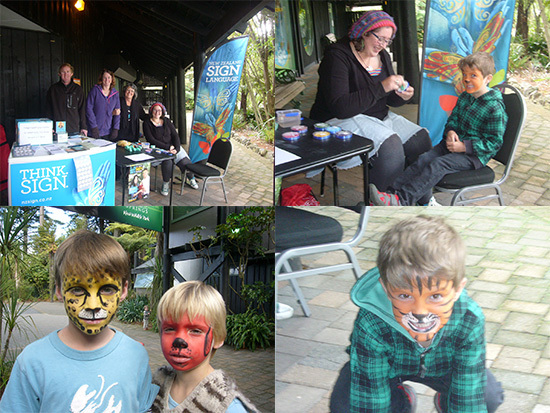 We had a great time on Sunday 10th May for our NZSL Week events! Many families and youth and adult Deaf Community members were there, as well as members of the public that stopped by to see what we were doing. 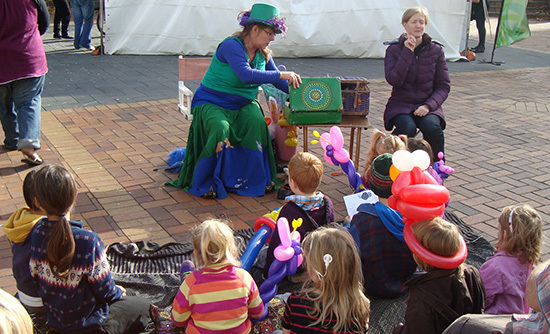 The children enjoyed the balloon artist, storytelling and face painting. And the bus ride afterward was great! Let’s have a nice lunch to celebrate Brydee’s first baby. Please tell Anna or Michelle before Monday 25th May if you’re coming! The office is closed Monday 25th and Friday 29th May. Anna is away on Tuesday 26th May. There have been some really good feedback from our taster classes held here in Invercargill. Special thanks to our tutor Roxanne who is doing a great job and seems to be breezing through the schedule without any hassle. 2016 might see a demand for more classes which is a positive. Thank you to Hine and Stephen Clover who volunteered their time on Wednesday 6th May with a Crafts Day. We thoroughly enjoyed it. We have made some beautiful flax flowers, fish, stars and paper roses. I really appreciate your help and hope to do it again. Well done to those who attended the First Aid course on Monday 11th May. There was fantastic feedback from the tutor and students. Everyone passed, so they will receive their Certificate in First Aid Level One. Handwaves and congratulations! Come and be a part of this annual event. Bluff is home to this iconic winter event and this year’s event will be on a fabulous new site. Brought to you by the locals of Bluff with a uniquely Southland flavour. Succulent Bluff oysters and lots of southern fare will tempt your tastebuds, washed down with great local beers and New Zealand wine. Grab your coat and head on down to Bluff for a fun filled day of live music, Oyster opening and eating competitions and succulent food in a wonderful atmosphere. Tickets are available from the Invercargill City Council, Esk Street Invercargill; Bluff Service Centre and Barnes Oysters, Spey Street Invercargill as well as online at Ticketdirect.